When it comes to supervillain origins, there's stupid, and then there's stupid. Professor Ramsey Norton made it his life's mission to create a way to save the Earth. Every experiment continued to yield no results. Norton disposed of the chemicals into a humanoid-shaped vat that he nicknamed "Chemo." Over time, the chemicals began to mutate. The catalyst was a failed plant growth serum. Chemo became a lifeform with basic sentience. 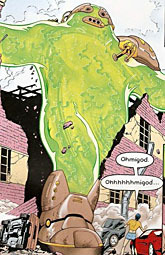 After killing Norton with its acidic breath, Chemo went on a rampage until he was defeated by robot team the Metal Men. Chemo is seemingly rendered inert or destroyed only to resurface some time after. I mean, really. Why are you storing all your old waste, Prof. Norton? And beyond that, why is the vat human-shaped? You know what works really well? Vat-shaped vats. If you live in a world with superheroes and supervillains, you're just asking for trouble if you build something shaped like a human. Eventually it's going to come to life, and good or evil, the first thing it's going to do is kill you, because it doesn't know any better. 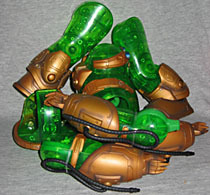 Chemo comes in six pieces, divided among the figures of DC Classics Series 9: head/torso, arms, legs and crotch. Yes, there are seven figures in DCU9, but Green Arrow only comes with a display base. The pieces fit together tightly, but could probably be pulled apart again safely. Probably. I'm not about to try it, but you feel free. If they break, let us know. There are black tubes running from each gauntlet that plug into the back of his shoulders; press hard to get them all the way in. Fully assembled, Chemo stands 10" tall - but since he's generally meant to be a massive monster, that puts him more in scale with Minimates than anything Mattel's ever put out. Articulation is below even Mattel's already sub-par standards: hinges and rockers in the ankles, hinged knees, swivel hips, swivel waist, swivel/hinge wrists, swivel/hinge elbows and swivel/hinge shoulders. No neck, no biceps, no chest, no hinges in the hips, no swivels in the shins... some of that can be attributed to the sculpt, or an effort to keep the inside "empty." This is the modern Chemo, rather than his original look. The difference? 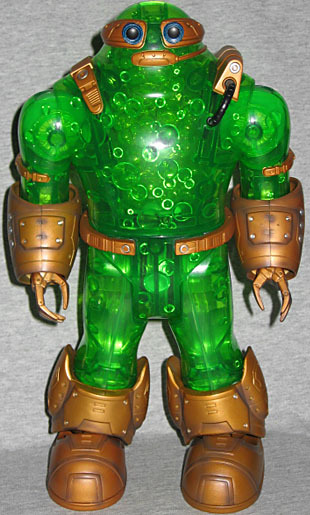 Classic Coke Chemo was completely bare, just a giant green lavalamp with a pointy head; new Chemo has a flatter head (think Juggernaut with his helmet on) and is "wearing" all sorts of technological bits for no discernable reason. 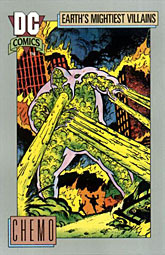 This design originated in 1997's Supergirl #4, after a full decade's absence. The story is a good one-shot, by the way: hunt it down if you can. To most fans, though, Chemo's probably more recognizable for his role in Infinite Crisis #4, where he's dropped out of the sky onto Bludhaven (the Gary, Indiana to Gotham City's Chicago). 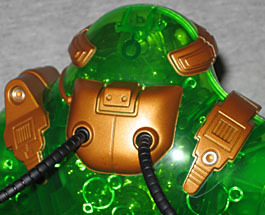 Chemo is translucent green, with bronze/brass elements on the surface. We already discussed the way Chemo has been sculpted with internal bubbles, and how many Chemos are missing the insert in the chest that adds more. 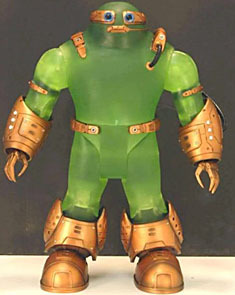 That wouldn't have been a problem, if Mattel had stuck with the original idea, which was to make the figure a cloudy, occluded green that's more in line with the comics. At least, that's what all the prototype pictures showed, and it's a lot cooler than the final product. As with every clear figure, the necessary internal construction defeats the illusion. Smokey colors would have helped hide that, and maybe even made him look a bit glowy. On the other hand, the mechanical bits all look wonderful. They're a nice solid bronze, with dark shadows airbrushed around the sculpted seams. There are silver touches scattered about, such as rivets or outlining on some of the round elements, and they're not particularly sloppy. His "eyes" - or at least, the goggle-like apertures on his head top-of-shoulder-lump area - have blue rims, which match spots on the underside of his feet. Chemo is an unexpected choice for a BAF: he's not particularly popular; his most famous role was as more of an accessory than a character, so he's far from what you'd call "well-known"; he's not even very dynamic, so they couldn't have been thinking from a pure "toy" standpoint; all Chemo has going for him is an interesting visual, and even that's brought down by the realities of moving from the printed page to three dimensions. There will probably never be another Chemo toy, however, and even if there were, do you really trust DC Direct to do a better job than this? Yes, Chemo has his faults, but he's still kind of adorable, and even undersized, he'll make a decent villain for the upcoming Metal Men to fight.